These cinnamon rolls are awesome. They aren’t just any ordinary cinnamon rolls. They have a mix of spices along with chocolate chips. They are also huge! 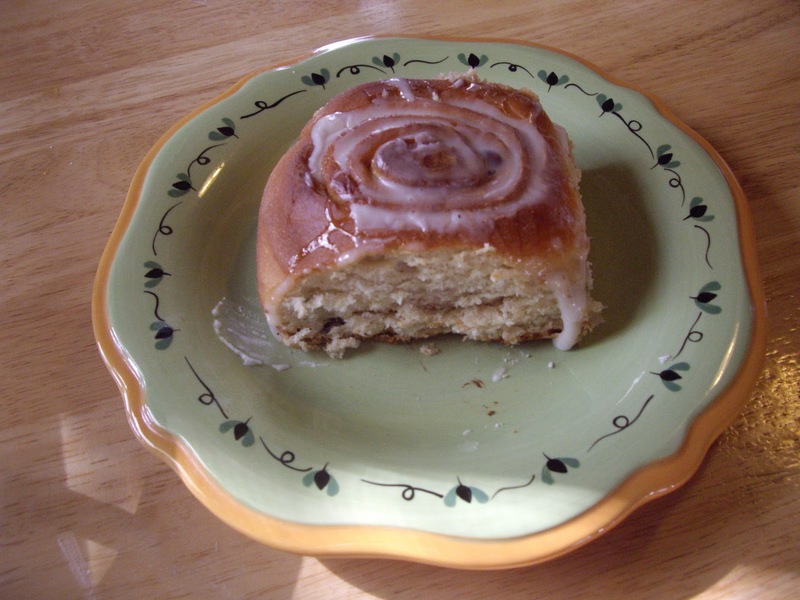 You will need a large mixing bowl for the sweet roll dough. 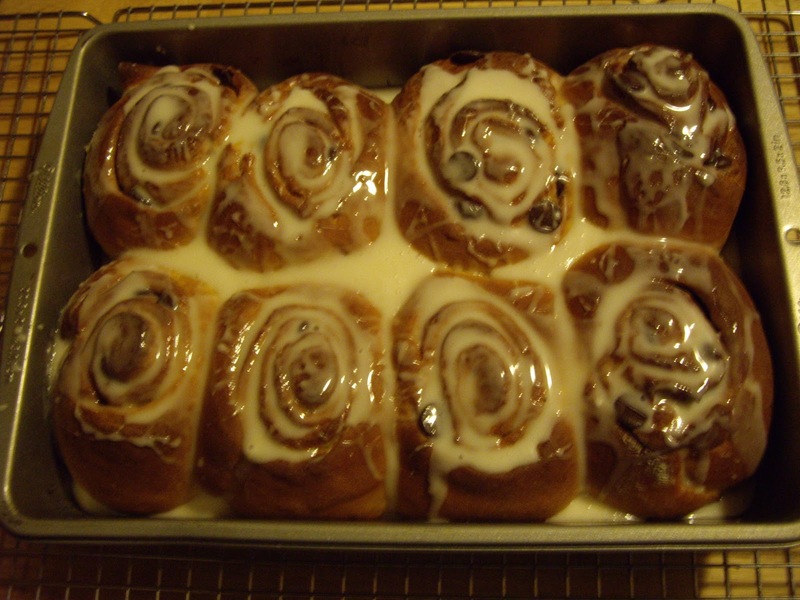 You will also need a 9″x13″ greased cake pan for baking the cinnamon rolls. In a large bowl, add the warm water and sprinkle in the yeast and stir to dissolve. Add the milk, sugar, butter, salt, eggs and about 3 cups of the flour. Beat well and add 1-2 more cups of flour until you get a soft dough. Turn the dough out onto a floured counter and knead until the dough is smooth and elastic. This will take about 5 minutes. If you have a stand mixer with a dough hook you can use that, starting first with the flat beater and switching to the dough hook after all ingredients are mixed in. Butter or oil a large bowl and put the dough into it. Turn over so it has oil all over. Cover with plastic wrap or a towel and let rise until double. This will usually take 45 minutes to an hour. Punch down the dough and let it rest while you get the filling ingredients together. Mix the sugar, cinnamon, coriander, cloves, allspice, and cardamom in a small bowl. Measure out the chocolate chips and put them in another bowl. Flour a counter or marble slab. Roll the dough out with your rolling pin into a 16″x18″ rectangle. Spread with the 1/4 cup butter. Sprinkle with the sugar/spice mixture. Roll up tightly, starting on the 16″ side. Pinch the ends tightly to seal. Cut the roll into 8 equal slices. Put the rolls into the prepared cake pan. Cover with a towel and let rise for 30-40 minutes. While it rises, preheat your oven to 375 degrees Fahrenheit. When doubled in size, put the rolls into the oven and bake for 25-30 minutes. Remove from the oven and let cool while you mix up the glaze. For the glaze, whisk together the powdered sugar, milk, and vanilla extract. Spoon the glaze evenly over the warm cinnamon rolls. Serve. Enjoy. Cover any remaining cinnamon rolls. Makes 8 very large cinnamon rolls. I'm drooling…I was just visiting my mom, and I haven't had dinner so when I clicked on your site I just about had a heart attack! You are quite the baker! Go to the store so you can make some. You won't regret it. YOU KNOW THESE ARE MY FAVORITES!